Attaches PDF files as underlays to the current drawing through the Drawing Explorer. Note: To import PDF files as drawing entities, use the PdfImport command. Displays the Select PDF Underlay File dialog box; select a PDF file. 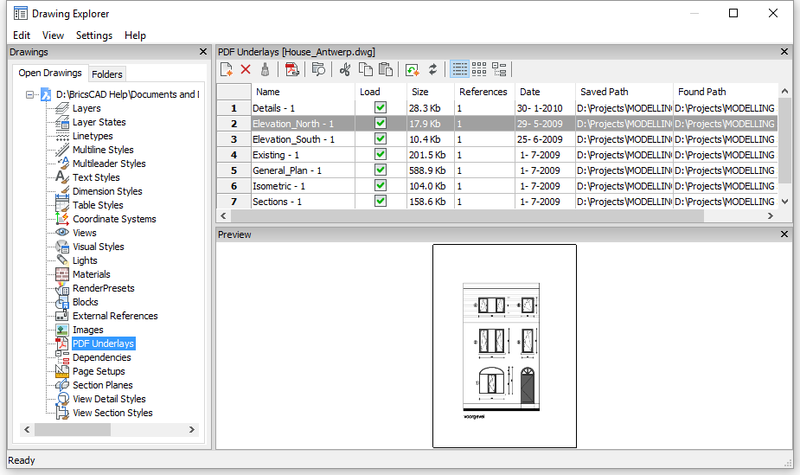 Displays the Attach PDF Underlay dialog box; specify parameters. Detaches the selected PDF attachments without warning. Cuts or copies information about the PDF attachment to the Clipboard so that it can be pasted into another drawing; you cannot paste the data into the current drawing. Displays the details of attached PDF files, as shown below. Reports the size of the PDF file. Reports the number of times the PDF is attached to the drawing. Reports the date of the file. This can be useful in determining whether you ware working with the most recent revision. Click the Browse button. BricsCAD displays the Choose a File dialog box. Locate the missing PDF file. Reports the path to the PDF file. Pdfclip - allows clipping of PDF underlays. -XRef - attaches and controls xrefs through the command bar. Insert - inserts drawings as blocks. Explorer - opens the Drawing Explorer dialog box.